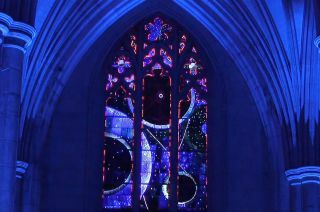 “We are blessed enough to be stewards of our very own piece of the moon here at the cathedral that is embedded in our Space Window on the south side of the cathedral and it is lit up tonight," said Reverend Randy Hollerith, the dean of Washington National Cathedral, at "The Spirit of Apollo" on Dec. 11, 2018. Standing beneath a stained glass window embedded with a piece of the moon, Jim Lovell recalled his journey into lunar orbit 50 years ago. "In this cathedral, my world exists within these walls," said Lovell. "But seeing the Earth at 240,000 miles, my world suddenly expanded to infinity." Lovell joined the director of the National Air and Space Museum, Ellen Stofan, and NASA Administrator Jim Bridenstine in commemorating the Apollo 8 mission, which famously included a Christmas Eve reading from the Book of Genesis live from lunar orbit. "Apollo 8 was full of surprises. We knew we were going to the moon. But hearing the story of creation beaming down to us on Christmas Eve, even the steely-eyed flight directors in Mission Control wept," said Stofan. "Some of our bravest pilots and sailors, riding atop repurposed weapons of war, delivered a message of peace for all humankind. That was the spirit of Apollo." Lovell, together with Frank Borman and Bill Anders, were the first people to see the far side of the moon with their own eyes. They were also the first to witness "Earthrise," the sight of our planet emerging from behind the lunar surface. Prior to attending "The Spirit of Apollo" event at National Cathedral on Tuesday, Dec. 11, 2018, Apollo 8 astronaut Jim Lovell visited the National Air and Space Museum to view the gloves he wore on the historic 1968 lunar orbit mission. "I wonder if when they saw it, and then later we saw it, and when they read from Genesis, if God kind of gave a cosmic smile. And I wonder if God said, "Now y'all see what I see,'" said the Most Reverend Michael Curry, presiding bishop of the Episcopal Church. "Some have said that that was a moment that changed human consciousness forever," said Curry. A color photo of Earthrise, captured by Anders, is largely credited with giving rise to the modern environmental movement. Borman's decision to read verses from the King James Bible was heard by the largest audience that had ever listened to a human voice. The Apollo 8 mission led to the first humans landing on the moon seven months later. In total, 24 Americans voyaged to the moon, with 12 walking on its surface. Washington National Cathedral lit for NASA and the National Air and Space Museum's "The Spirit of Apollo" event in Washington, D.C. on Tuesday, Dec. 11, 2018, including stars projected on its ceiling. "The last time we had boots on the moon was 1972," said Bridenstine. "But now we are looking at tonight and thinking about the future, what are we doing next and how are we going to accomplish it." "We are here tonight to celebrate the 50th anniversary of one of history's highest achievements and to begin to answer the question of where we go next," said Stofan. "If the moon is within our grasp, nothing is beyond our reach, but we must decide together where to start. Tonight we find ourselves, like that Christmas Eve 50 years ago, in the beginning." That next journey will rely on technology, on international cooperation, national leadership and commercial ingenuity. It will also require a measure of faith. "God gave mankind a stage upon which to perform, how the play ends is up to us," said Lovell. Watch "The Spirit of Apollo," marking the 50th anniversary of Apollo 8, at collectSPACE.